The Department of Justice (DOJ) just released a commemorative poster highlighting the six most-recent multi-million dollar settlements that drug companies have agreed to pay for inappropriately, and in some cases illegally, promoting prescription drugs. The poster represents just the latest version of the "DOJ v Pharma Settlement Planetary System," which still has room for additional members (see unidentified objects in the poster). The smallest "planet" in DOJ's System is AstraZeneca, which was fined $520 million to resolve allegations that it illegally promoted the anti-psychotic drug Seroquel. The drug was approved for treating schizophrenia and later for bipolar mania, but the government alleged that AstraZeneca promoted Seroquel for a variety of unapproved uses, such as aggression, sleeplessness, anxiety, and depression. AstraZeneca denied the charges but agreed to pay the fine to end the investigation. NOTE: The size of the AZ settlement "planet" is so small in comparison to the others in the System that many experts do not consider it a true "planet" at all. (The AZ planet was "discovered" in April 2010). Next is Merck, which agreed to pay a fine of $950 million related to the illegal promotion of the painkiller Vioxx, which was withdrawn from the market in 2004 after studies found the drug increased the risk of heart attacks. The company pled guilty to having promoted Vioxx as a treatment for rheumatoid arthritis before it had been approved for that use. The settlement also resolved allegations that Merck made false or misleading statements about the drug's heart safety to increase sales. (The Merck planet was "discovered" in November 2011). The fourth largest planet is the DOJ System is Eli Lilly, which was fined $1.42 billion to resolve a government investigation into the off-label promotion of the anti-psychotic Zyprexa. Zyprexa had been approved for the treatment of certain psychotic disorders, but Lilly admitted to promoting the drug in elderly populations to treat dementia. The government also alleged that Lilly targeted primary care physicians to promote Zyprexa for unapproved uses and “trained its sales force to disregard the law.” (The Lilly planet was "discovered" in January 2009). Next largest in size is Abbott, which was fined $1.5 billion in connection to the illegal promotion of the anti-psychotic drug Depakote. Abbott admitted to having trained a special sales force to target nursing homes, marketing the drug for the control of aggression and agitation in elderly dementia patients. Depakote had never been approved for that purpose, and Abbott lacked evidence that the drug was safe or effective for those uses. The company also admitted to marketing Depakote to treat schizophrenia, even though no study had found it effective for that purpose. (The Abbott planet was "discovered" in May 2012). Pfizer, which up until recently was the largest planet in the DOJ System, was fined $2.3 billion in September 2009, then the largest health care fraud settlement and the largest criminal fine ever imposed in the United States. Pfizer pled guilty to misbranding the painkiller Bextra with "the intent to defraud or mislead", promoting the drug to treat acute pain at dosages the FDA had previously deemed dangerously high. Bextra was pulled from the market in 2005 due to safety concerns. The government alleged that Pfizer also promoted three other drugs illegally: the anti-psychotic Geodon, an antibiotic Zyvox, and the anti-epileptic drug Lyrica. 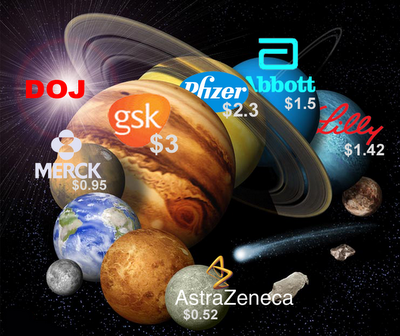 GlaxoSmithKline is currently the largest planet in the DOJ v Pharma Settlement Planetary System. GSK agreed to pay a fine of $3 billion to resolve civil and criminal liabilities regarding its promotion of drugs, as well as its failure to report safety data (see "GSK Guilty of Off-Label Marketing from 1999 to 2010: Will Pay $3 Billion Settlement"). This is the largest health care fraud settlement in the United States to date. The company pled guilty to misbranding the drug Paxil for treating depression in patients under 18, even though the drug had never been approved for that age group. GlaxoSmithKline also pled guilty to failing to disclose safety information about the diabetes drug Avandia to the FDA. (The GSK planet was "discovered" in July 2012). Seriously? Wow... who knew the DOJ actually had an art department? And what precisely, are we, the American public, supposed to "commemorate"? I'm the art department! It's a joke.. duh! BTW Can I get that poster in a 24X36? Got a great spot on the stairs for it!